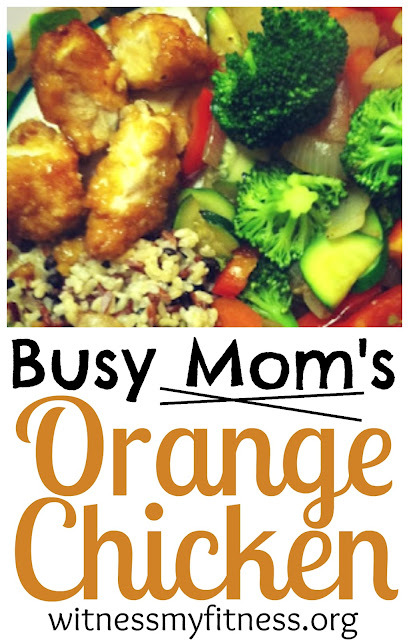 The main ingredient of this Orange Chicken is, well, the chicken. I understand that it probably is healthier for me to cut up my own chicken breasts, dip them in eggs and bread them with almond meal or something like that. However, 355 days out of the year, I just don't have time for that. So, the main ingredient for this meal is pictured below. That's right! 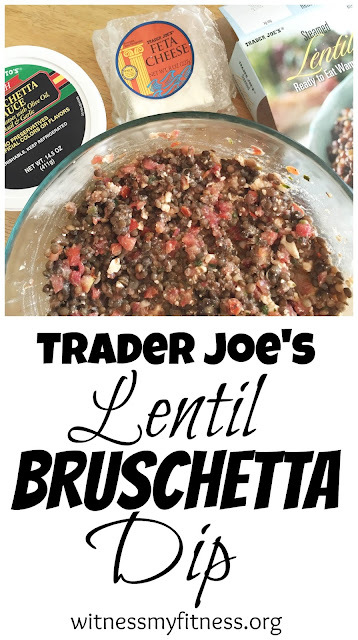 Trader Joe's saves the day, once again! 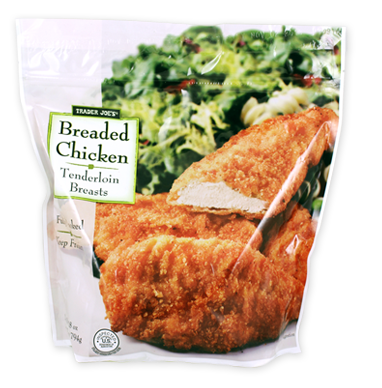 These tenderloins are actually very tasty and are around $7 a bag. Well worth it to me! By the way---an extra bonus is that these chicken breast are very low in sodium for a frozen item! Although the chicken is the main ingredient, it's all about the sauce, which is the homemade portion of this recipe, fresh squeezed OJ and all! 1) Heat oven to 400*F.
2) Spread chicken across a 9 x 13 casserole dish. 4) Turn chicken over and cook for another 8 minutes. 5) Pour half of sauce over chicken. Turn chicken over to make sure it is coated in the sauce. 6) Bake chicken for 7 minutes. Pour most of the remaining sauce over chicken. Garnish with green onions. Enjoy! 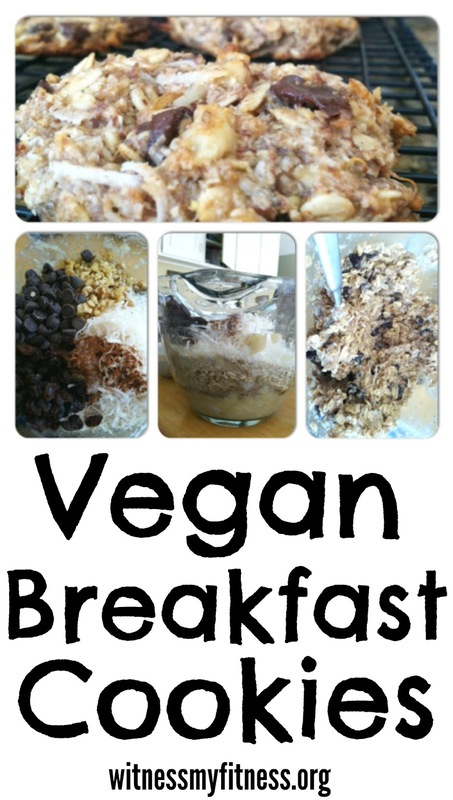 1) In a saucepan, combine all ingredients except for the cornstarch and the 1/4 cup water. 2) Turn on heat and bring to a boil. 3) While the sauce in heating up, combine 3 T cornstarch with 1/4 cup water. 4) Slowly mix cornstarch/flour into sauce until it thickens. 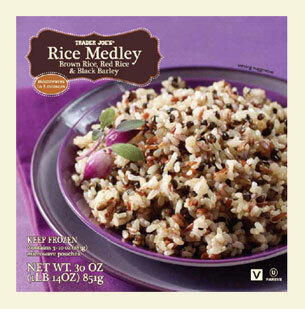 If you are wondering what we eat this delicious Orange Chicken with, we always pair it with this rice medley from Trader Joe's. It takes 3 minutes in a microwave for steamed rice. Nothing beats that! I make sautéed veggies to have with it most of the time, but this time, I quartered Brussels Sprouts, put them in a 13 x 9 pan, sprinkled olive oil, sea salt, pepper, and fresh garlic and onions on it and put it in the oven with the chicken. It took about 5 minutes more to bake than the chicken, but WOW! It was worth it! If you use the whole bag of chicken, this meal feeds a good amount of people. It tastes great the next day, so leftovers are always nice! September is a stressful time of year for quite a few people. If you are a child or a teen, the excitement or nervousness for the start of school year can cause stress. If you are a parent, the added pressure in the schedule of your child starting the school year and all the activities and events that go along with that can surely add to the weight on your shoulders. I personally have had a stressful week. I started my homeschool year for my three kids (pre-k, 1st grade, and 2nd grade), AND I have had to face the reality of jury duty the same week. Although, God has been truly gracious, and I've been put on "phone hold" every night I call in so far. There are a few more stresses I can add, but, for your sake, I will refrain! Recently, my kind mother-in-law gave me a coloring book with the hopes that I would sit quietly (a rarity) and be able to color my stresses away. This seems to be very popular, and for good reason! It really does help me relax. Of course, I love to paint and draw to relax as well. It's like all the cares of the world just slip away when I allow myself to be creative in that way. That gift of the coloring book and my stressful week have inspired me to create a list of frugal de-stressers that we all could use a little more of! 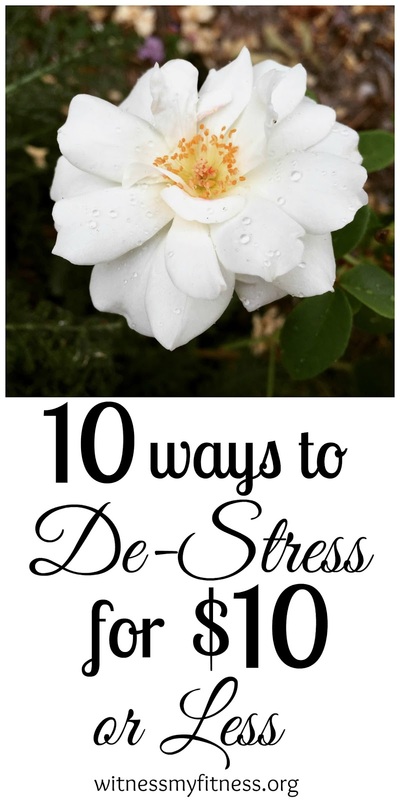 10 Ways to De-stress for Around 10 Dollars or Less! 1. Color your stress away in an Adult Coloring Book. 2. Stay calm and drink caffeine free tea. My favorite is Rooibos tea because it has so many health benefits. It has a rich flavor, but no caffeine! 3. Take an epson salt bath. Relax your muscles with the salt and use one with Lavender to relax your senses. 5. Light some candles, preferably lavender scent! Lavender is known to relax! 6. Get outside. (Don't forget sunscreen!) Wether you sit and read a good book, or just sit, getting outside and taking in fresh air can help reduce stress levels. 7. Do sweat it! Endorphins can make you feel happy and energized. This can make you prepared to handle stress with a more positive outlook. I have found that punching helps me destress, which is why I like the Tae Bo Workout DVDs. Billy Blanks is somehow so very calming, reassuring and encouraging. I feel very de-stressed after his workouts! 8. Write down your thoughts. If you have a nice journal, you may be more likely to write in it! Sometimes we just have to let all our stresses out. Writing them out can help those stresses work themselves out in our mind. 9. Take up yoga. I'm not talking about the meditation part of it, but the stretches and the breathing do relax you! When I encounter yoga workouts with meditation, I pray instead. I don't try to empty my mind of things. I fill it with prayer and scripture. What I find most relaxing is using the time to pray, breathe, and stretch. 10. Unplug and read a book instead. Read to yourself. Read to your kids. Put down that iPhone. Shut off that laptop. Go ahead, turn off the show you are bingeing on Netflix. We've all seen the studies on how good it is to unplug for a bit! In our homeschool routine, we read from a book aloud every afternoon. I find it so relaxing, especially paired with a good cup of tea, a light blanket, and cuddly kids! Currently, we are reading through the Chronicles of Narnia series. Where is the first place you go when you walk into a Trader Joe's? For my family, it's right back to the sample counter. We are usually greeted by kind faces with tasty treats. A few years back, one of those samples changed my life. This may sound like an exaggeration, but I assure you, it isn't. After tasting that sample, I was able to put together a dish I can bring to potlucks, church lunches, and serve at parties in less than two minutes. That's right. Two minutes. Wait. It get's even better. It's only three ingredients! AND even better... you don't have to use it as a dip! It's versatile! Pick up a fork and use it as a salad! Clearly, I can't hold you back from this life-changing recipe any longer! I really do hope you enjoy it as much as my friends, church members, and family have enjoyed it! 1. Put Lentils in large bowl and break apart with fork. 2. Add feta and break apart with fork. 3. Add Bruschetta and stir until all ingredients are mixed evenly. 4. Serve with crackers, chips, or on toasted baguette. My oldest isn't a big breakfast eater. He's happy with a bowl of Trader Joe's crispy rice cereal. I, however, am not happy with that. He needs more! So, why not make him the next best thing: cookies! Yes. Cookies for breakfast. What could be better? This is great for busy families, especially this time of year when everyone is getting used to starting school again. I know the struggle of having to drag kids out of bed just to force feed them before school starts! So, for those moms and dads out there that deal with that on a regular basis, you're welcome! Preheat oven to 350F. Grease or line cookie sheet with foil. Get the wet ingredients together, and then dry. Mix together until it comes together. Using a 1/4 cup scoop, I dropped the dough onto my pan, and flattened them out with my fingers. If you get stuck to the dough, just dip your fingers in some water before flattening them. Bake them for 20-25 minutes, or once they’ve browned. Let them cool on the pan for 10 minutes or so, and then move them to a cooling rack. Enjoy! 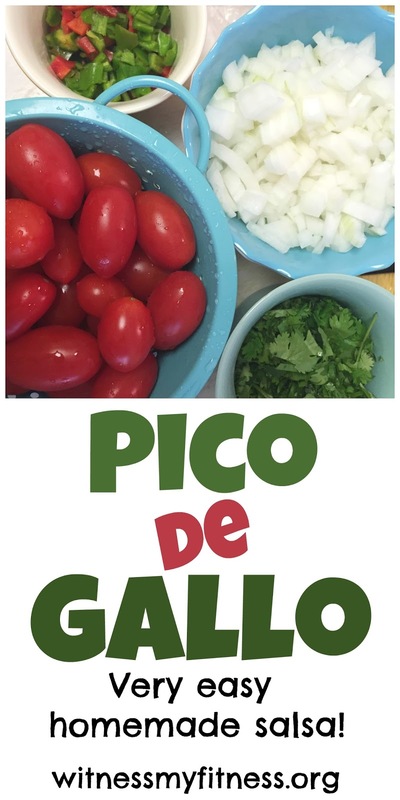 Did you know that Pico de Gallo literally means "Rooster's Beak?" There are many theories as to why it is named this from the way it used to be eaten with the thumb and the forefinger, as a rooster would peck to the colors being similar to the colors of a rooster, but nobody seems to know the certain origins of the salsa's name (Source). In Mexico, it is also called "Salsa Fresca" and "Salsa Mexicana." I have the privilege of living next to what we call "farms," but are really large fields with stands to sale what they grow. This summer, my favorite thing to buy there is tomatoes, chiles, onions, and cilantro. I then make pico de gallo out of it and put it on anything from eggs to salad to tacos. 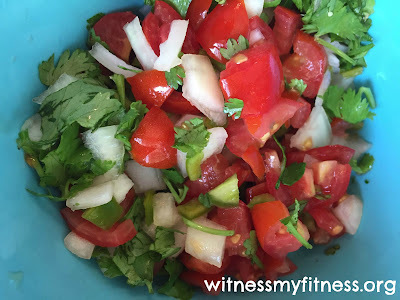 This recipe is so easy to make you may never buy salsa again! Pico de gallo goes great on a zucchini boat! How many have read Proverbs 31 and have been inspired by the woman who has become one of the main role models for Christian women? I have. Although, I would have to admit, I also become intimidated by all the things she does. I have to remember I can't do anything without the strength of God. I must remember that I will fail no matter how hard I try, but God gives grace, and I must give myself grace too. With that in mind, I'm going to focus on the two verses that jumped off the pages this morning as I was reading Proverbs 31. The other day, while considering moving a full sized deep freezer on my own, I realized that I have the physical strength to do that, and I was reminded of the purpose of strength and how easily swayed we are from that due to vanity. In context, the passage is speaking of this women, this wife, buying fields and planting them. When it says "dresses herself" it actually is referring to "girding her loins," which is what they had to do to prepare for physical activity. They wore long robes and had to tie them up. This supports the view of getting fit for the purpose of functional fitness---being able to have to strength to carry out everyday activity. And, if you need to move a freezer or a wood pile, you have the strength to do that as well. This is actually quite inspiring! The value of a woman's strength is in the Bible! It is good for a woman to be strong. It is good for her to have strength to do the things she needs to do in order to take care of her family and household! Beauty can be vain. It shows in many areas of the fitness world where there is no sign of God truly being praised for His magnificent creation. It's a challenge to remember to give Glory to God, even on "Flex Friday!" As humans, we all will naturally be inclined to vanity. Vanity can deceive you. It can deter you from keeping your eyes truly on Christ and your purpose as a Christian, to bring glory to God. So how then, do we as Christians, stay clear of vanity when it comes to fitness and strength? I'm not going to give you a list of "Do's and Don'ts." Just examine your heart continually. When you are posting that photo on Instagram, ask yourself, "Why?" Is it because we know that certain kind of photo will gain followers? Is it because we desire to bring glory to the One Who Made Us strong? When you decide to join a competition, is it to reveal in your own strength, or His? I"m not going to say it's wrong to post photos of yourself flexing, but there is a difference between posting modestly to encourage others verses posting photos that only your husband should see. What encouragement can we get from these passages? There certainly is a balance. The purpose of our strength should not be solely for showing off muscles. It shouldn't be to show off our body. That kind of beauty can be vain because we are not bring glory to our Creator, but the creation. But, strength is a good thing! Go ahead! Do those deadlifts! Run that 5k! Do those handstands! Gain strength and take the glory to our Mighty Creator who created such potentially strong and functional bodies! This way, if your car breaks down, you can push it to the curb! If your freezer needs to be defrosted, you can roll it outside. If your four year old needs a nap in the middle of Pike's Place Market, you can hold his dead weight of 40lbs for an hour. You can go for an early morning run, pack your kids up for a whole day of errands, return home, cook dinner, clean the kitchen, bathe the kids, and still survive. This is functional fitness. This is the kind of strength that brings glory to God and honestly shows what we were created for. This is the kind of strength that helps us live functional and active lives for our families. It goes so much deeper than flexed muscles. Go ahead, dress yourself, prepare for action, and make your arms strong! Looking for a simple, but great workout to get you sweating? 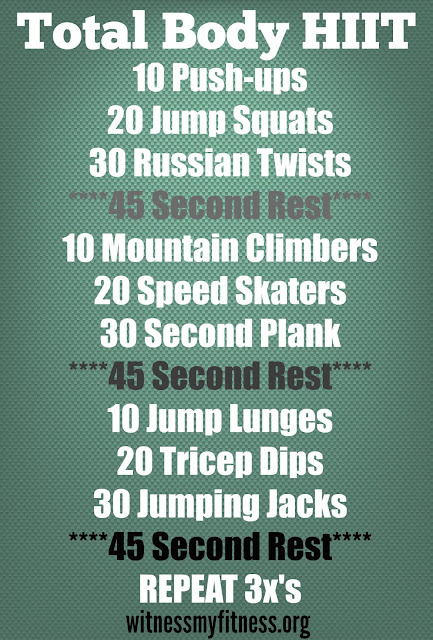 This HIIT (high intensity interval training) workout will get you sweating, burn fat, and build muscle! Try it out and let me know what you think! If you like it, share it!